Israeli occupation forces (IOF) raided a number of villages, south of Al-Khalil, at dawn Monday but no arrests were made. Eyewitnesses told the PIC that IOF patrols roamed the vicinity of Samu, Daheriya, and Yatta villages, and broke into and searched a number of homes in Dura town. They said that the soldiers set up a roadblock near Fawar refugee camp and another near Nijhut settlement to the southwest of Al-Khalil and searched passing vehicles. Israeli forces on Thursday detained a Palestinian man and released him in the middle of the Hebron desert hours later, the directorate of education in the southern West Bank area said. Bilal Rizq al-Salayma, 27, was heading to his workplace at the ceramics center at the Ministry of Education when Israeli soldiers stopped him, searched him, took his ID card, handcuffed and blindfolded him, and forced him into a military vehicle. The incident was relayed to the Hebron directorate of education by witnesses and the center’s administration. The directorate said in a statement: "We received a phone call from al-Salayma at noon telling us that he was in a barren, mountain area … It was filled with sand, and nothing near him was alive." The directorate added: "We guessed that he was left blindfolded in the al-Masafer area near Bani Naim east of Hebron so we told him to head west, north, and south to tell us if he saw (vehicles). We asked him to head toward them before the call was disconnected after his battery ran out." After that al-Salayma found himself in Beersheba in Israel after people helped him get to a construction site where laborers from Hebron worked. The laborers took him to Hebron, which he reached at 10 p.m.
Israel's military did not immediately respond to an email seeking comment late Sunday. 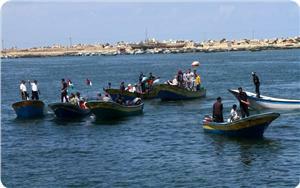 Israeli navy gunboats opened heavy machinegun fire at Palestinian fishing boats off the central Gaza Strip coast on Sunday night. The PIC reporter in the area said that the gunboats opened indiscriminate fire at the fishing boats off Deir Al-Balah beach. He said that at the same time Israeli choppers were flying overhead and over the eastern border area. Israeli military vehicles have been moving near the Gaza borders all over the past week coupled with over flights of military choppers. Two Palestinian citizens were wounded, one of them seriously, on Sunday morning in an Israeli aerial raid on Deir Al-Balah city in central Gaza Strip. Dr. Ashraf Al-Qudra, the health ministry spokesman, told the PIC reporter that an Israeli reconnaissance plane fired a missile at a motorbike in the vicinity of Shuhada Al-Aqsa Hospital. He added that driver of the bike was seriously wounded and had one of his hands amputated while a passerby was moderately injured. Local sources identified the driver as Abdullah Al-Khirti, a resistance fighter, adding that he was in critical condition. 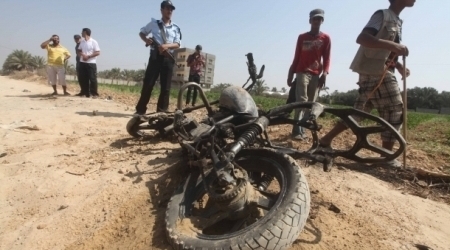 Israeli warplanes targeted a motorcycle in Deir al-Balah in the central Gaza Strip on Sunday morning, injuring two young Palestinian men, Gaza medical sources said. Spokesman for the Gaza Strip ministry of health Ashraf al-Qidra told Ma'an that two Palestinian men were evacuated to al-Aqsa Martyrs Hospital in Deir al-Balah after an Israeli reconnaissance plane fired a missile at their motorcycle. Medics said one of the victims was critically wounded and the other sustained moderate injuries. An Israeli army statement identified the target of the strike as Abdallah Kharti, who was described as a "key Popular Resistance Committees operative" who was involved with "numerous incidents of rocket fire towards Israel." The statement added that Israeli forces had "operated in order to eliminate an imminent threat to the lives of Israeli civilians," without further detail. 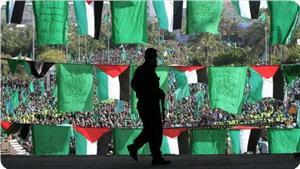 The Popular Resistance Committees are a Gaza-based militant group that opposes negotiations with Israel. The group has no affiliation to the local popular resistance committees that organize regular protests in the West Bank. Recent weeks have witnessed an increase in tensions on the Gaza Strip, as Israeli forces have repeatedly opened fire on Palestinian protests near the border and launched a number of airstrikes. Israeli forces killed six Palestinians and injured 41 in attacks on Gaza in January, Ashraf al-Qidra, spokesman for Gaza's Ministry of Health, said in early February. Palestinian militants, meanwhile, have fired dozens of rockets toward Israel, which have all landed in unpopulated areas with no injuries reported. The Gaza Strip government is under Hamas control. While Hamas itself does not routinely fire rockets, Israel says it holds the group, which seized power in Gaza in 2007, responsible for such attacks. Hamas and Israel have maintained a fragile ceasefire since Nov. 2012, when Israeli forces launched a major assault that killed around 170 Gazans. A video, captured by Rami Alarya of the Alqods Independent Media Center, showed a number of Israeli soldiers assaulting a Palestinian child, on Friday evening [February 4 2014], after shooting him by a rubber-coated metal bullet in the leg, and photographing themselves abusing him. The soldiers took pictures of themselves with the wounded child, and a soldier picked up a Molotov cocktail from the ground, while the child shouted in Hebrew, “it’s not mine, it’s not mine”, and a soldier responded, “it’s yours, it’s Ok…it’s yours”. Israel forces raided several towns in the Jenin district, on Saturday, provoking clashes with residents, according to security sources. Confrontations erupted between Palestinians and Israeli forces following an army raid on Silat al-Harithiya, a village located to the west of Jenin. Soldiers fired stun grenades, tear gas canisters and rubber-coated metal bullets at the stone-throwing Palestinians, causing many suffocation cases, WAFA Palestinian News & Info Agency has reported. Israeli forces had also raided Yabad, a town located to the southwest of Jenin, for the second day in a row, declaring the town a closed military zone. They set up random checkpoints, launched a large-scale search campaign in the town and broke into Yabad Boys School and stationed themselves, there. Elsewhere in the West Bank, Israeli forces broke into and set up military checkpoints in some residential neighborhoods in the southern city of Hebron, said security sources and witnesses. Soldiers also raided the towns of Samou and Idna, in the Hebron area, setting up military checkpoints at the entrances of Dhahriya, Dura and Fawar refugee camp, located to the south of Hebron, as well as Sair, a town located to the northeast of Hebron. They stopped vehicles travelling on the roads and inspected passengers’ ID cards. Hamas movement described the “brutal” Israeli attacks on worshipers in the Aqsa Mosque and on activists in Ein Hijle village on Friday as a new “Zionist crime”. Hamas in a statement on Saturday affirmed that such “desperate” attempts would not succeed in breaking the willpower and steadfastness of the Palestinian masses. “We, in Hamas, strongly condemn the savage attacks on worshipers in the Aqsa Mosque and peaceful activists in Ein Hijle village,” it said, adding that such “cowardly acts” only exposed further the “reality of this usurping entity”. Hamas warned the Israeli occupation of persisting in such practice, expressing conviction that it would not “secure a foothold for occupation on our land”. Dozens of Palestinian activists, politicians and journalists have sustained injuries at dawn Friday as hundreds of heavily armed Israeli occupation forces broke into and destroyed Ein Hijleh village that was established seven days ago by Palestinian youths. Eyewitnesses told the PIC reporter that Israeli soldiers have brutally attacked Palestinian youths and forced them to leave to the nearby mountains, and prevented journalists from covering the attack. Hundreds of Israeli police and troops stormed the village at 0100 am (local time) and started firing flare and sound bombs, and forced the activists off the site. Ambulance crews rushed to the scene to transfer the injured. Ein Hijleh protest village was established by Palestinian activists on the 31th of January in Jordan Valley as part of Melh Al-Ard (Salt of the Earth) Palestinian campaign. 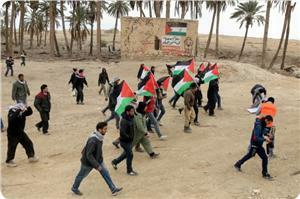 The objective of the campaign is to protest the ongoing Israeli annexation of the Jordan Valley. Approximately 120 activists including political leaders have participated in the campaign. 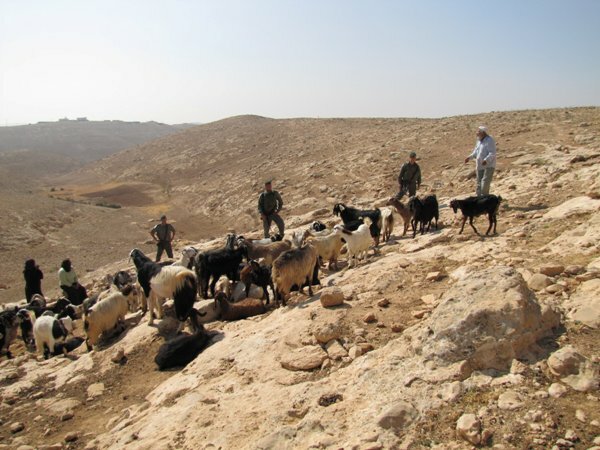 The Israeli occupation authorities have prevented access to the revived Jordan Valley village of Ein Hijleh under the pretext of being a closed military zone. Dozens of Palestinian civilians were wounded in Israeli occupation forces’ shooting of live and rubber bullets at demonstrators in Jalazoun refugee camp and Silwad town near Ramallah on Friday. The PIC reporter said that ten citizens were wounded in their legs with live bullets in the confrontations between civilians and IOF soldiers in front of Jalazoun refugee camp while others were hit with rubber bullets. Two demonstrators were hit with teargas canisters in their heads, he added. The reporter noted the extensive use of teargas by the soldiers, adding that two of the soldiers were hurt in the clashes, one with a stone and the other was treated for suffocation after demonstrators threw back gas canisters at the soldiers. A massive march was organized in the refugee camp to protest the IOF cold-blooded murder of one of the young men in the camp about ten days ago. 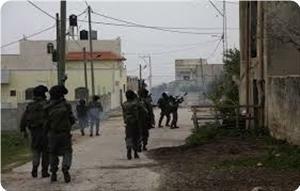 Meanwhile, violent clashes were reported in Silwad town where four soldiers were hurt in the stone throwing. Eyewitnesses said that more than ten citizens were injured with rubber bullets while ambulance crews treated dozens for breathing difficulty. Palestinian and foreign anti-settlement activists on Friday protested Israel's violations against the prisoners, the holy city of Jerusalem and the Aqsa Mosque. Dozens of activists suffered bullet and tear gas injuries when the Israeli occupation forces (IOF) violently suppressed their peaceful marches in different areas of the West Bank. The IOF subdued the weekly march in Masarah village and prevented the activists from reaching the annexed land near the segregation wall. In Kafr Qaddum village, the IOF brutally attacked the march and fired a hail of rubber bullets and tear gas grenades at the protestors. 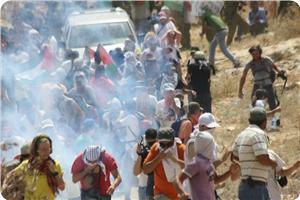 One child and three activists were reportedly injured during the IOF attack. In Al-Khalil, the weekly march of Beit Ummar town saw violent clashes with Israeli soldiers. 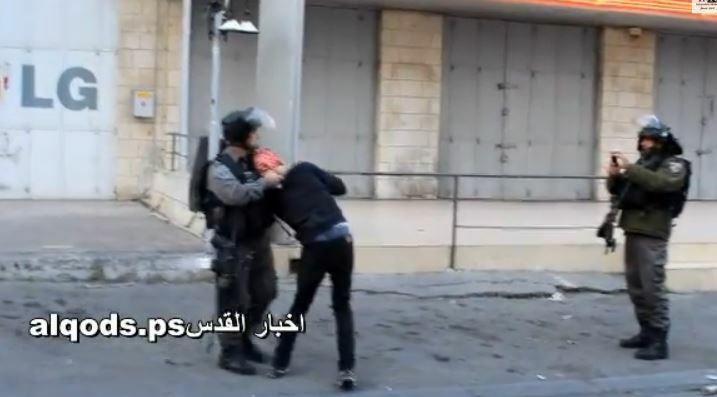 One Palestinian was reportedly detained and many others suffered injuries during the events. 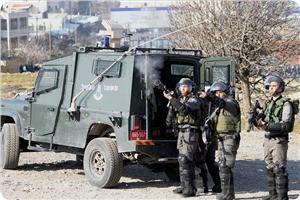 Similar clashes with the IOF also took place in the nearby Al-Aroub refugee camp. Palestinian medical sources have reported that a Palestinian child was moderately injured, when an explosive dropped by Israeli soldiers exploded near him, in Khirbit Sha’b al-Batm, in Yatta town, south of the southern West Bank city of Hebron. Rateb Jabour, coordinator of the Popular Committee against the Wall and Settlements, stated that Abdullah Ishaq al-Jabarin, 13, suffered various injuries, and was moved by Red Crescent Medics to the Hebron Governmental Hospital. The incident is one of scores of similar incidents that led to dozens of casualties among the Palestinians, especially since the army uses inhabited Palestinian territories for training, using live ammunition and explosives. On January 22, 2014, a Palestinian child was seriously wounded when a bomb, dropped by Israeli soldiers during training, exploded in his hands in the Jordan Valley of the occupied West Bank. In February of last year, a Palestinian child was killed, and three children were injured, in two separate incidents, when un-exploded Israeli military bombs detonated near them, in northern Gaza. In November of 2012, a five-year old Palestinian child suffered head injuries and died of his wounds, in a similar incident that took place in Khan Younis, in the southern part of the Gaza Strip. Earlier the same month, three children, between the ages of three and five, were seriously injured when an explosive device, left by the Israeli army, detonated near them in the town of Beit Hanoun, in northern Gaza. Dozens of Palestinians, including children, workers and shepherds, have been wounded, and many were killed, due to undetonated explosives dropped by Israeli soldiers during repeated wars on Gaza, as well as explosives dropped by the army during training near Palestinian communities in the occupied West Bank, especially in the Jordan Valley and Northern Plains. Coordinator of the Popular Committee against the Wall and Settlements, Rateb Jabour, has reported that Israeli soldiers kidnapped two Palestinians in Beit Ummar town, near the southern West Bank city of Hebron. Jabour stated that the soldiers ambushed resident Mohammad Mahmoud Darwish, 17, in the al-Ein area in the town, and hurled concussion grenades at him before kidnapping him. The soldiers also kidnapped former political prisoner, Moath Shihda Sabarna, 22, in the same attack, and took the two Palestinians to the Etzion nearby military and security base. Hours before the attack, clashes took place in Beit Za’ta area, in the town, after dozens of soldiers invaded it and fired rounds of live ammunition, rubber-coated metal bullets and gas bombs. Medical sources said several Palestinians were shot with rubber-coated bullets, while dozens have been treated for the effects of tear gas inhalation. 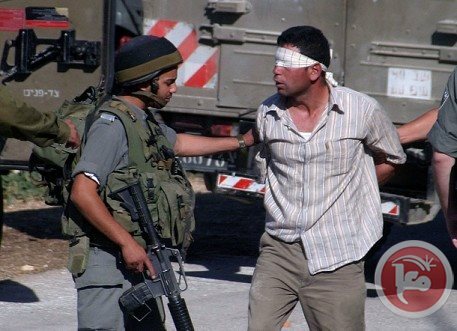 Also on Friday at night, dozens of soldiers invaded Wad Fokkin village, west of Bethlehem, detained several young Palestinians, and interrogated them. Ahmad Sukkar, head of the Wad Fokkin village council, stated that the soldiers surrounded the town, and invaded it before surrounded its center and interrogating dozens of local youths. On Thursday evening, a young Palestinian man was shot and wounded by Israeli army fire in the al-‘Arroub refugee camp in Hebron, while dozens were hurt by gas bombs and rubber-coated metal bullets.